How does Google+ and Authorship Influence Search Engine Rankings? In a recent post on YouMoz, I discussed the rankings success and traffic increase that my brand new site received immediately after implementing Google Authorship on the Jeffalytics blog. My conclusion was that Google Authorship was the root cause of the success, because the site received a sudden increase in traffic shortly after I implemented Google Authorship on the site. The truth is that there were too many variables to be considered in that experiment, so further experimentation is needed for the results to be more conclusive. I did not isolate Google+ Authorship as the only factor contributing to my increased site rankings, so rankings may have increased due to other activity such as tweets or links from authority sites. The feedback and questions about the methodology used and conclusions drawn were very valuable, and inspired me to create a more definitive study on the subject to test my conclusion. 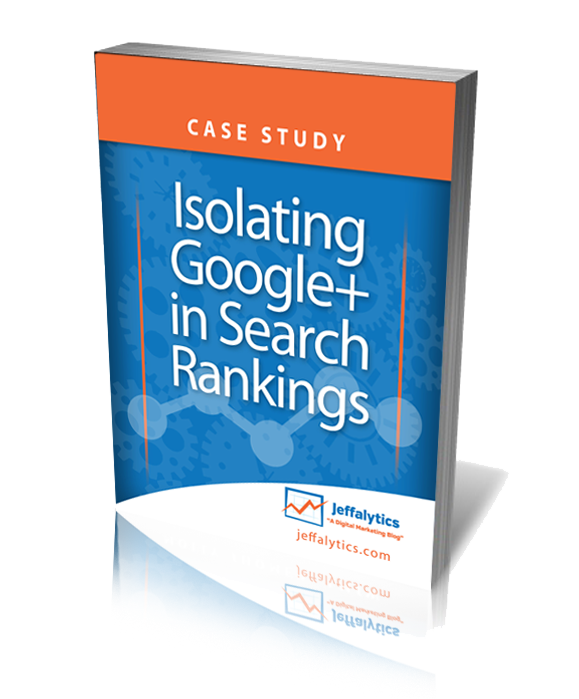 The following post outlines an experiment I conducted over a 3 week period using a more scientific approach to isolate the impact of Google+ Authorship on search results. Google+ Authorship from an Established Google+ profile will increase search engine rankings on a brand new website domain. 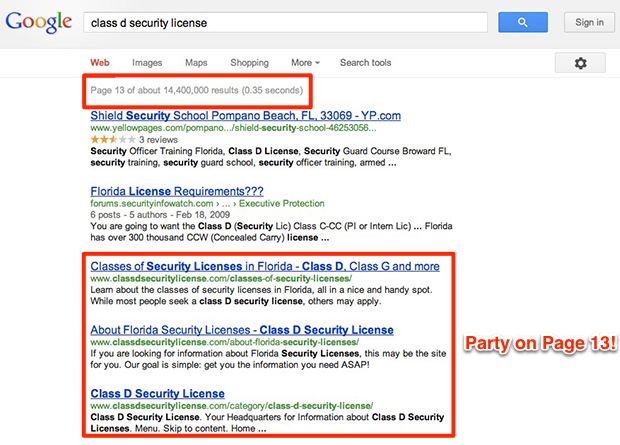 Google+ Authorship will not be granted to a new Google+ account or impact ranking credibility of the new domain. 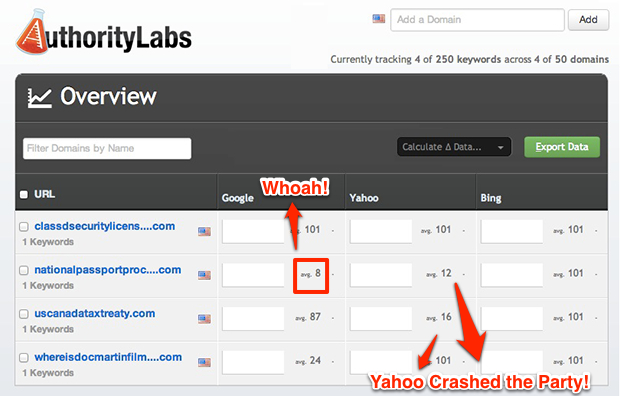 All Keyword research was pulled on February 16, 2013. 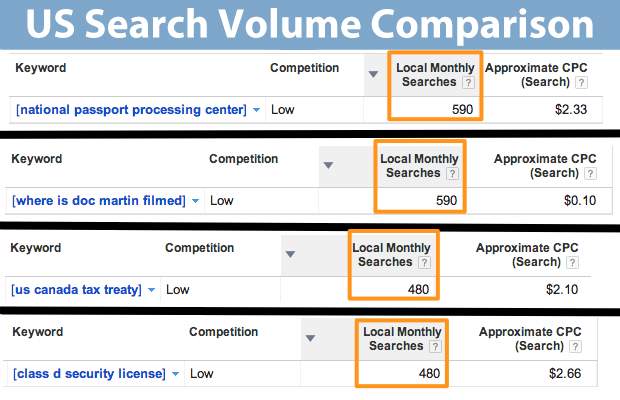 *Note on Competition: I intentionally chose lower competition keywords in order to help with the speed of this study. Too much competition and this study would take too long and likely be difficult to achieve ranking on Google+ Authorship alone. My established Google+ Profile (Jeff Sauer) was assigned to a niche site closely related to my expertise (Travel Blogging). This is closely related to my niche of travel blogging and I actually wrote a post about my unplanned visit to the National Passport Processing Center in DC on my personal website. That’s a thrilling read if you have time. Where necessary, proxy servers were used to disambiguate between accounts and prevent IP address or cookie based bias in Google search results. New Google accounts were created using a proxy server with an IP address in a different part of the United States. Continued account access was also done through a proxy server. 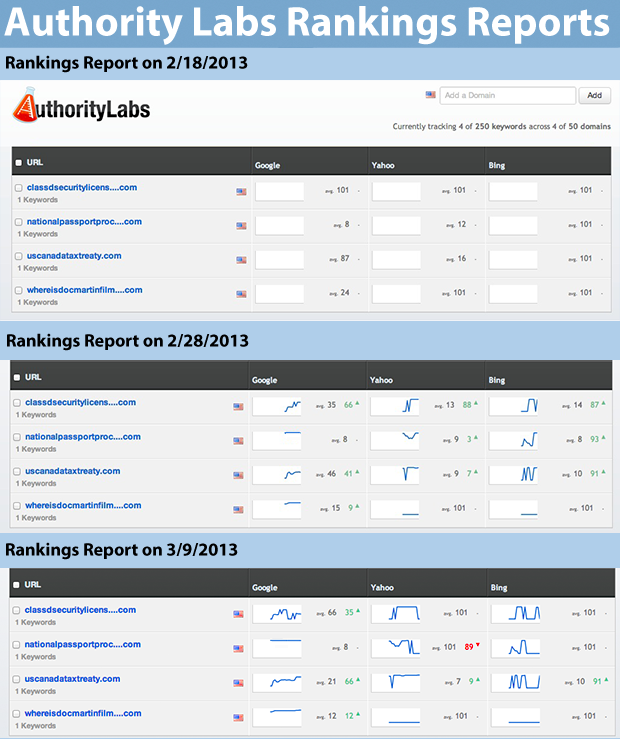 Search rankings were checked using Authority Labs rank check tool. For the 3 sites that were tied to a Google+ profile, promotion involved simply pushing out a single Google+ post that linked to the homepage from each account. All posts were done within 10 minutes of each other and were sent out publicly to Google+. For the US Canada Tax Treaty site that did not have a G+ post to promote the page, the only way it could be found by search engines is through the XML site map or Google Analytics. Now comes the fun part; putting the experiment into action and testing how the impact of Google+ and Authorship on website rankings. Initially, there were two places I wanted to look in order to get an indication of the type of results that would be coming in: Google Webmaster Tools to make sure the site was crawled and the Rank Check tool to see if the site would rank. It only took a day to start seeing immediate results for both. Less than 24 hours after the sites were verified and submitted to Google+ I started seeing data in Google Webmaster Tools showing what exactly they crawled. The three sites that were shared on Google+ were crawled immediately. The site with no Google+ account or share was not crawled after 24 hours, even though an XML site map had been submitted. The Authority labs tool was configured to check on the rankings of each site on the major search engines for the primary keyword. My expectation would be that none of the sites would see any significant rankings for the first several days, and even then it would likely not be in the top 100 results. This made automated rank checking important to the experiment – it gave me the ability to the needle in the rankings haystack. The day after the sites launched I immediately started seeing results! In fact, the National Passport Processing Center site was showing an average ranking of 8 on Google and 12 on Yahoo. Side Note: How the heck did Yahoo find this site so quickly! Are they using publicly available G+ data to factor into their rankings? Not only were the sites ranking, one of them was ranking very high. Even better, the site that ranked immediately is the site that I hypothesized would rank immediately. It is directly in the niche of topics I talk about often on Google+ (Travel), and I wrote the content directly from the heart based on my own personal experience. On 2/18 I verified what the rank checker was seeing and sure enough, the site was sitting at #10 when viewed the site in a fresh browser. The rank checker and I were seeing basically the same thing. 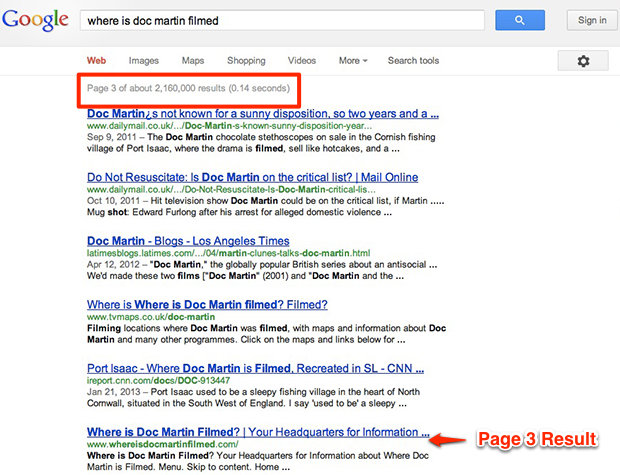 The other sites were true to their rankings as well, with the second site promoted by my established Google+ account, Where is Doc Martin Filmed, ranking #24 on average. 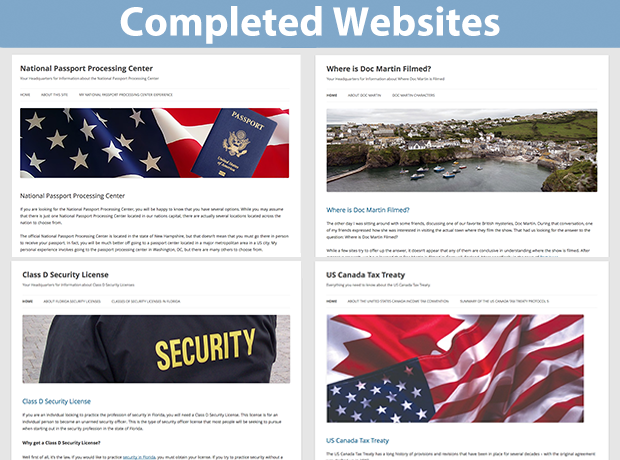 The other two sites were ranking much lower, with Class D Security License ranking on page 14 and US Canada Tax Treaty on Page 8. 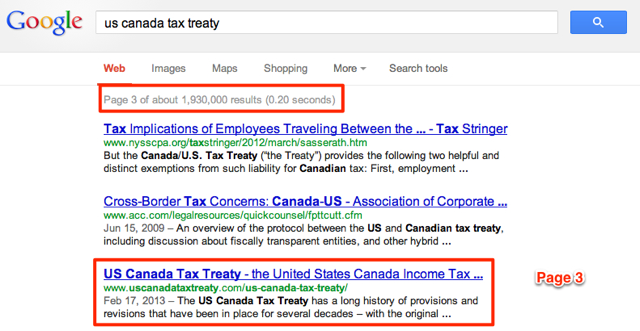 I am actually surprised that the US Canada Tax Treaty website was ranking at all, because according to Google Webmaster Tools they had not yet crawled the site. In addition, it’s odd that one of the tag pages was ranking and not the homepage. Observation: Brand new websites linked from an established Google+ Account will rank faster and better than new websites without a tie to an established Google+ account. The most surprising effect of seeing the first day of results from the Google+ and Authorship experiment was that these pages were ranking well with no sign of authorship being enabled or granted to the site. This pokes holes in my theory that Google+ Authorship alone impacts rankings. Instead, it seemed that a Google+ share from an established account was all it took to propel these niche sites into a quality ranking. Still, I wanted to see if authorship played any role in rankings, and I know that I had established it both in my Google+ account Contributor links as well as within the metadata on each site, so something seemed odd. I double checked my Contributor links on Google+ and noticed that I had 12 links in place. While I always thought that there was a limit to how many blogs I could contribute to, I was wondering if being over a certain limit of contributorship was preventing my newest sites from having the author box. Observation: I may be contributing to too many sites for Google to believe. Surprising to me, simply removing those two sites from my contributor profile in Google+ appeared to have a positive effect on enabling authorship in these new sites. Sure enough, National Passport Processing Center happened to show the authorship box and be in position #8 (up two spots from previous day). 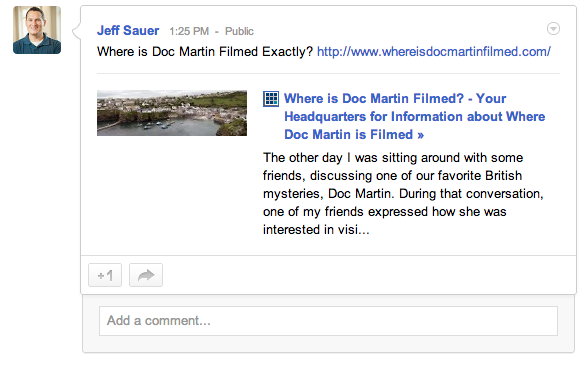 Where is Doc Martin Filmed ranked the same, but also showed Google+ Authorship. Observation: For my Google+ account, I can only contribute to 10 websites before I lose my ability to show authorship. This may vary for others, but my guess is that this is a limit for everyone. 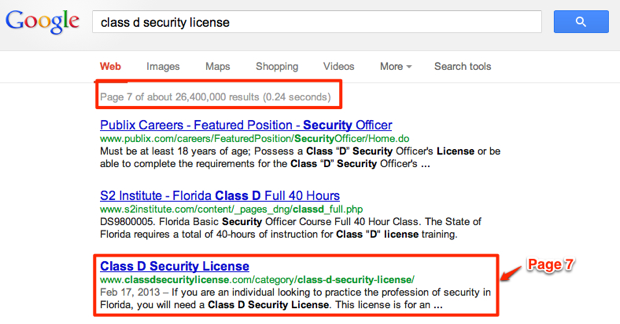 Observation: Google+ Authorship is earned, not given. “National Passport Processing Center” jumped the #8 position on Google immediately after being published and has stayed there ever since. The only change for this keyword and site are that more pages have found their way into the search results page, occupying slots 8-10 on the first page of Google. “Class D Security License” has actually come the longest way since the first launch, moving from page 14 to page 7 over the past 3 weeks. 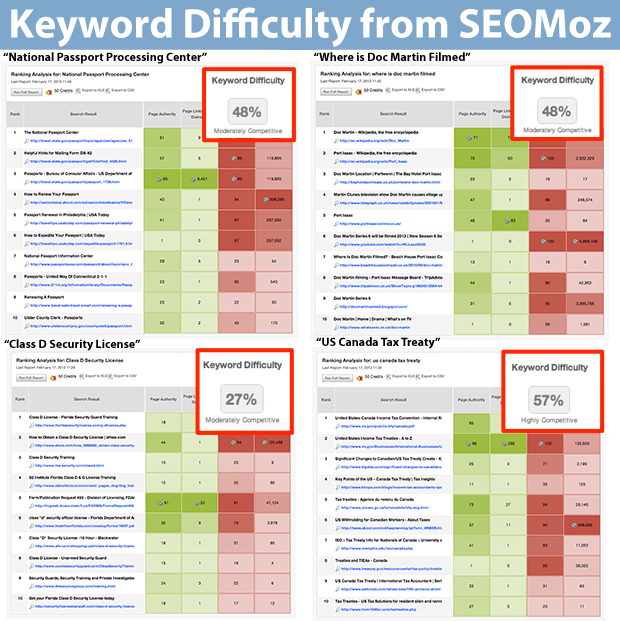 While this was shown as the least competitive keyword by SEOMoz, it is having the most difficulty achieving quality rankings. It also appears that the total number of results being counted for Google for this keyword is growing every time I conduct a search, with a total of over 26 million results listed now. “US Canada Tax Treaty” took the longest to get started, because it had no promotion from Google+ or Author assigned, but it has slowly risen in the search results over the past three weeks to the point where it may crack the first page within the next month. I would like to think that this is because the content is high quality and topically relevant (my wife helped me write the article, since international tax is her specialty). It most likely would be in the top 10 by now had I used my Google+ profile to promote the content. The search queries report in Google Webmaster Tools reflects everything we have come to know and understand about the importance of being on the first page of search results. Basically, the first page gets the big piece of chicken and the rest are fighting for table scraps. Observation: It’s more important than ever to show up on the first page of search results. 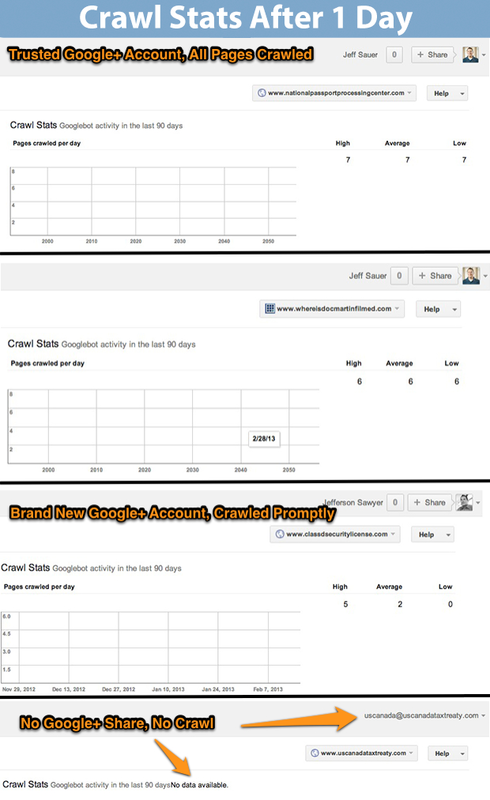 Enable Google+ Authorship to increase your CTR. Observation: Check your Google Author Stats to see where you are showing up most as an author. Observation: Impressions and Authorship don’t always correlate to click throughs and traffic. 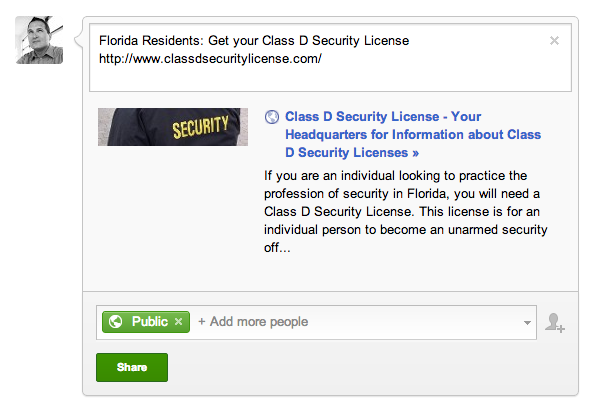 They have to be scraping G+ data, because that is the only way they could have known about my site! It will become more difficult to trust an SEO analysis tool that does not incorporate Google +1’s into their data front and center. I hope that the smart tool makers are already tapping into the Social Data Hub to pull more of this information into their analysis tools. 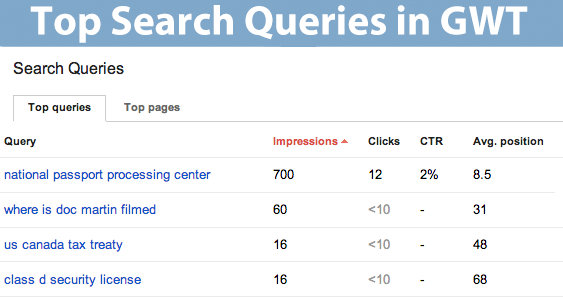 Quantify the value and impact of your writing in search results from right within Google Webmaster Tools. A new site can see meaningful rankings within a day of the domain name being registered.